At least one person was killed and 10 others wounded in overnight shootings in Chicago as a long holiday weekend began. Police said a man was killed late Friday night in the city's Back of the Yards neighborhood. A 36-year-old man was found on the sidewalk around 10:45 p.m. in the 5400 block of South Damen Avenue with gunshot wounds to the head and thigh. He was transported to John H. Stroger Jr. Hospital of Cook County where he was pronounced dead, according to authorities. 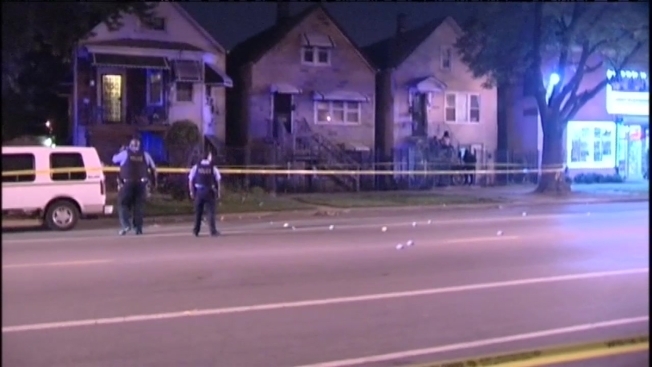 At least 10 others were wounded in shootings Friday night and into Saturday morning. Just after 5 a.m. Saturday, a 28-year-old man was shot in the back in the 2600 block of West 65th Street. The man told police he was sitting outside when someone exited a vehicle and fired a gun in his direction. The victim fled the scene and collapsed in the 6500 block of South Washtenaw Avenue, according to Chicago Police News Affairs Officer Amina Greer. He was transported to Advocate Christ Medical Center in stable condition. Around 2:45 a.m., a 47-year-old was shot while sitting in her car in the 8100 block of South Muskegon Avenue. The woman told police she "heard shots and felt pain" when she realized she had been shot in the side. She was listed in critical condition at Stroger Hospital. An hour earlier, a 32-year-old man was shot in the arm in the 4400 block of South Archer Avenue. The man was a passenger in a vehicle when he said he "heard shots and felt pain." He was taken in stable condition to Holy Cross Hospital. Around 12:30 a.m., a 34-year-old man was shot in the abdomen in the 10900 block of South Racine Avenue. The man was transported to Stroger Hospital in critical condition but was not cooperating with police, Greer said. On Friday, a 26-year-old man was shot just after 9 p.m. in the 10000 block of South Avenue M. The man took himself to Trinity Hospital with a gunshot wound to the back and his condition was stabilized, officials said. The man was walking on the block when a red SUV pulled alongside him and occupants in the vehicle displayed gang slogans, police said. A man then exited the vehicle and opened fire at the victim. Ten minutes earlier, a 32-year-old man was shot in the finger in the 4600 block of West Van Buren Street. The man transported himself to Loretto Hospital where he was expected to be treated and released. Two men were shot around 8:15 p.m. in the 1800 block of South Throop Street. The men were on a sidewalk when they told police a black SUV drove by and someone inside fired shots at them. A 22-year-old man was shot in the leg and was listed in stable condition at Stroger Hospital and a 19-year-old man was shot in the leg and listed in stable condition at Mount Sinai. Two men were shot at 7:05 p.m. Friday in two separate shootings. A 23-year-old man was shot in the foot in the 9100 block of South Yates Boulevard. The man said he was sitting on a porch when someone fired at him from a black SUV. The man was listed in stable condition at Trinity Hospital. At the same time, a 28-year-old man was shot while sitting on a porch in the 0-100 block of East 101st Street. The man told police he "heard shots and felt pain" and realized he was shot in the buttocks. The man was taken in stable condition to Advocate Christ Medical Center.